According to a U.S. Department of Agriculture report, a significant income gap continues to separate urban area and rural communities. This economic disparity is especially noticeable in the South. Since 2007 almost 22 percent of rural households in the region earn incomes that are below the federal standard for poverty. The report also notes that poverty has been more persistent in rural counties than in urbanized areas since the 1960s, when data comparing the differences were first officially recorded. 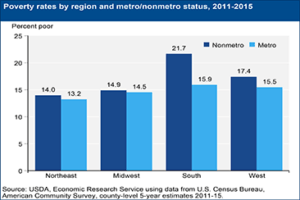 Employment in non-metro communities has also lagged behind trends in the rest of the nation, with 400,000 fewer jobs in those locations in 2017 compared to 2015. “Infrastructure investments, like expanding broadband internet access, could improve economic performance and contribute to quality of life through more robust delivery of education, healthcare, public safety and other services,” the report’s authors assert.